Political musings from Iceland: back to the “half-and-half” rule? Guðbjartur or “Bjartur í Sumarhúsum,” Bjartur in Summerhouse, is the protagonist of the novel Independent People by Halldór Laxness, who won the Nobel Prize in literature in 1955. His novel is the best description there is of the Icelandic mentality: Bjartur is the peasant who in his endeavour to survive on his own, independent of others, sows for his enemy to reap, according to Laxness. It may be an over-simplification to attribute the conservative streak in Icelanders to this mentality. But contrary to the other Nordic countries the Independence Party, the conservatives, have shaped the politics of post-war Iceland together with the Progressive Party, a centre party originating in the co-op movement and the rural communities. The Progressives have for a long time, successfully, resisted a shake-up of the electoral system towards re-balancing the weight of rural versus urban votes. In some of the smaller rural constituencies one vote has three times the weight of a vote in Reykjavík. This explains why the party most likely stands to gain more members of Parliament although the two parties – the Progressives and the Independence Party – will get similar results measured in percentage of votes. Based on this result, the IP would get 18 members of Parliament but the Progressives 20. The magical number of majority in Alþingi – the Icelandic Parliament – is 32 seats. If the two parties get the abovementioned seats they will hold a comfortable majority. The question is then: who will be asked first to form a Government – the party with the largest percentage of votes or the party with most elected Parliamentarians? Much might depend on the answer to this question. There are varying opinions as to the answer but also to the significance. Some claim that no one will actually want to form Government with the Progressives who might stumble in fulfilling their promises of extensive distribution of funds, squeezed out of foreign creditors to the two collapsed banks – Glitnir and Kaupthing – to indebted voters. By breaking campaign promises soon the Progressives would lose popularity even faster than Francois Hollande. Joining another party, as a second violin might make the situation easier for the Progressives. There are various number games in the situation. The IP might surprise and turn to the social democrats and Bright Future, two very similar parties (BF is partly an offspring of discontent Alliance people) but again, because they are similar the two parties might not be a reliable ally. Or, if asked first, the Progressives might turn to the left parties to form a left Government or to Alliance and Bright Future to form the first Icelandic centre Government. And so forth – various possibilities. However, given the number of votes to the two parties that have been together for 26 years in Government after 1944 – and out of the 69 years since the foundation of the Icelandic republic, the Independence Party or the Progressives or both have been in Government for 63 years. The joint story and rule of the two parties has lead to the concept of the “half-and-half rule” of the two parties, meaning that they have for decades divided Iceland and its resources between the two parties. 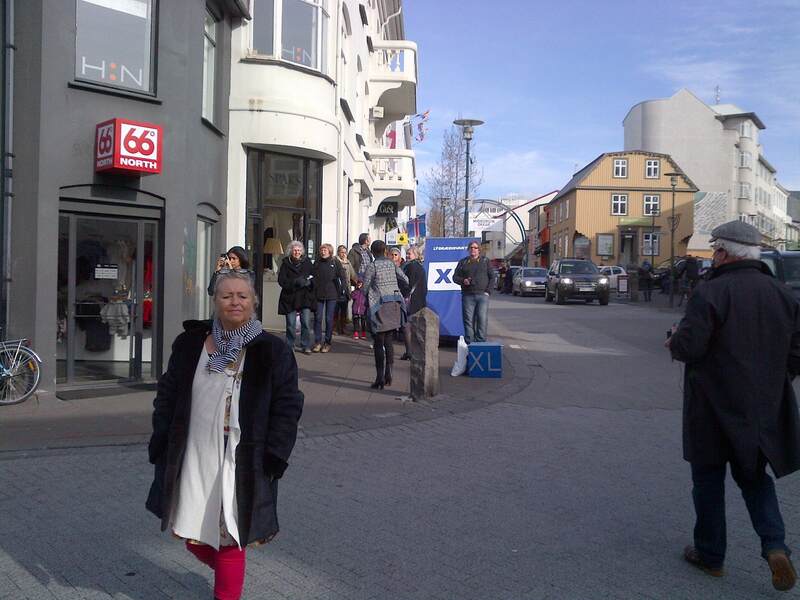 Nowhere was this as clear as when it came to the privatisation of the two big banks – Búnaðarbanki and Landsbanki – where people connected to the Progressives happened to buy Búnaðarbanki and people connected to the IP bought Landsbanki. If the two parties form a Government following the elections tomorrow it will be a return to the tried and tested “half-and-half rule.” Some see this rule as a major factor in the collapse in October 2008 though this is clearly not how ca. half of the voters gauge the situation. Support for the two old parties can also indicate certain nostalgia towards earlier times of perceived stability. But most likely, it indicates that the present coalition parties – social democrats and Left Green – which in Government managed to turn recession to growth and turn the unemployment curve, have been exceedingly bad at taking credit for this achievement. As politicians so often experience success is seldom rewarded. *Update: I forgot to mention that the Laxness quote is taken from a CBI’s working paper: Households’ Position in the Financial Crisis in Iceland – an informative report on household debt in Iceland. As the political parties, especially the Progressive Party, have focused so heavily on household debt one might easily be led to think the situation is particularly bad in Iceland. This paper shows that is not the case, seen in historical perspective. Subscribe to comments with RSS or TrackBack to 'Political musings from Iceland: back to the “half-and-half” rule? '.